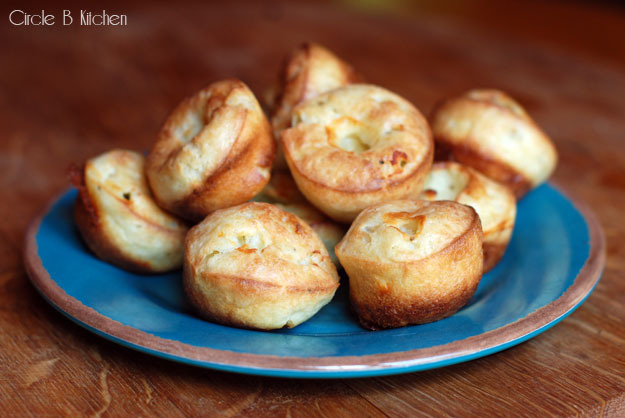 It may be self-evident from a cursory glimpse of the Circle B recipe index that we’re sort of partial to the popover. We’ve made these savory popovers (and these ones too), and sweet popovers and the ubiquitous Dutch baby, which is nothing more than a giant popover that's so good and so easy to throw together, it qualifies for breakfast around here several times a month. 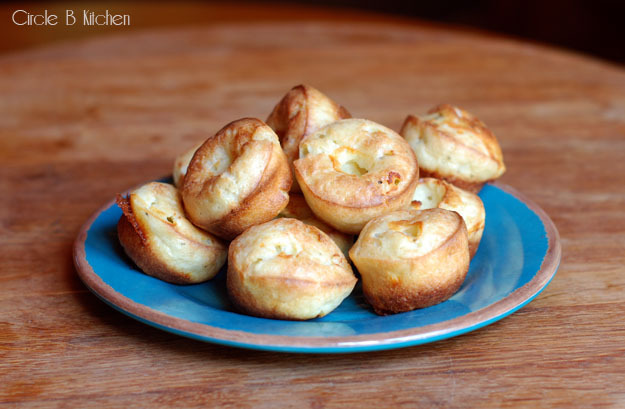 But being firmly esconced in the school of "one can never have too many popover recipes", we've added yet another to our ever-growing repertoire. And this magical little popover has won our hearts and carved its own special place in our little Circle B world of popovers. And what, you might ask, makes these little popover babies so special? 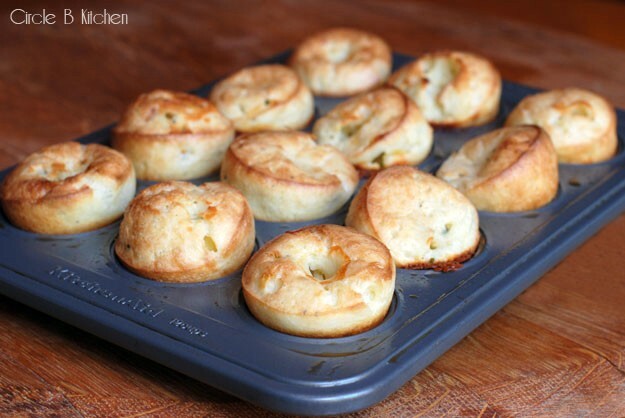 Well, for starters, as they bake, the outside bits gets all crispy on the edges, while the inside retains that soft, cheesy quality that makes popovers so dear to our hearts. If you’re a blue cheese-ophile, might I suggest you grab your mini muffin pan and get to baking. These are simply heavenly little bites of blue cheese goodness. Add more blue cheese if you dare, or put in a little less if you don’t. You can use any kind of blue cheese that you like here. I used a super creamy, and oh so tasty Point Reyes Blue and it was nothing short of divine. Serving suggestions run the gamut from football party to fancy dinner party to baby shower, wedding shower, bar mitzvah, office party, birthday party, brunch or happy hour, which has been our favorite application thus far. But I can also imagine these at breakfast with a spot of jam, especially if you make the batter the night before and just bake them off in the morning. I made a few changes to the original recipe, which I felt was sort of lacking in the flavor department. I doubled the amount of blue cheese and added more salt, and what we have now are some lovely little popover flavor bombs. Feel free to add more blue cheese if you really love the stuff, or maybe just choose a stronger blue cheese like gorgonzola. You can leave out the thyme if you like, but it does add a nice, subtle herbal note. Also, I’ve made these several times and didn’t feel like it made any noticeable difference to refrigerate the batter before baking, as the recipe directs, so you can make your own call on that. It might be convenient to make the batter early in the day to bake off later, so that’s a plus. The recipe also said to fill the muffin cups to the top, but I thought they came out better if they were filled a little less than that (see above photo). The popovers seemed to hold their shape better, especially if you cut back on the milk by a tablespoon or two, which I do. In a large bowl, whisk together the eggs, milk, melted butter, flour, salt and pepper. Whisk until all of the lumps have disappeared. Whisk in the cheese and thyme. Cover tightly and refrigerate for at least 2 hours or up to 1 day (see headnote). Preheat oven to 425 degrees. Position oven to rack to the top third of the oven. 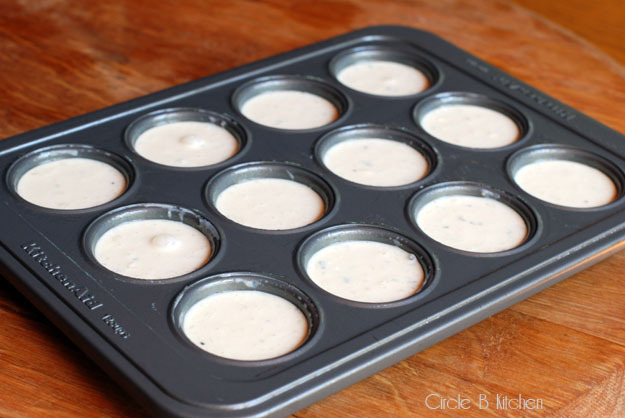 Spray two mini muffin pans with nonstick cooking spray and fill each cup almost to the top with the chilled batter. Bake popovers until golden and puffed, 18 to 20 minutes.